Psoriasis arthritis symptoms are easy to recognize, but difficult to treat. Millions of people from all over the World are suffering from this particular condition that is characterized by pain in the joints as well as psoriasis. The main problem related to this condition is that it is chronic and has the tendency to cause various other health problems as well. While the condition is not very dangerous, its treatment is quite difficult. Most medical experts claim that psoriasis arthritis is incurable, but some research has shown that properly recognizing psoriasis arthritis symptoms beforehand and then taking precautions to amend it may treat it to a significant extent. Even though psoriasis arthritis is not caused sue to the same reason, medical research that shown that more often than not, this condition is hereditary and is caused due to genetic reasons. This apart, another reason is a streptococcal infection that can trigger psoriasis in joints and can activate the immunity of the body. Devoid of gender men and women both can suffer from this condition. There are various kinds of psoriasis arthritis, they are not all the same. One must understand that since there are five different kinds of the condition, they are not caused by the same reason. This is why even their symptom and treatment is not the same. 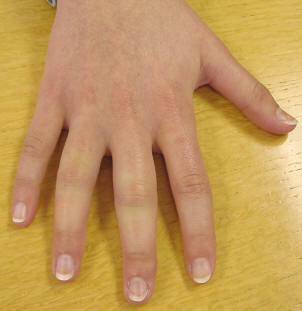 Symmetric Psoriasis arthritis, as the name implies affects body parts in symmetry. It targets both knees and both side of the body or both toes of the legs and other such parts. Though it is mild, if not treated properly, it can turn out to be severe and may lead to joints deformity. The Asymmetric Psoriasis arthritis is a mild form of arthritis and generally occurs in a particular part of the body, unlike symmetric arthritis. 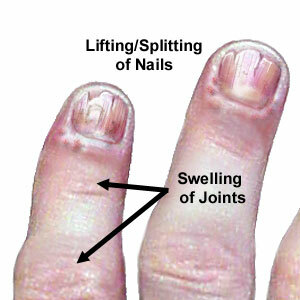 Its symptom can be recognized by swollen fingers or pain in the toes. The DIP Psoriasis arthritis is often thought to be similar to osteoarthritis, but actually only the last joints are affected by it. Spondylitis is one of the severe forms of Psoriasis arthritis and can lead to deformities of the spine if the treatment is not done properly. It causes inflammation of discs and joints of the spine and may even lead to pain in the neck, back or other body parts. Psoriasis arthritis mutilans are quite rare, but are regarded as one of the most severe kinds of Psoriasis arthritis. While there are five different kinds of psoriasis arthritis, one can be affected by one or more than one of theses at the same time. Hence it becomes imperative to understand the symptoms associated with each one of them for the best treatment. The first areas of the body where you will start experiencing pain are the joints and extremities. While many people believe that psoriasis arthritis symptoms can only be seen in these two areas, one must not forget that the condition is chronic and can easily spread to other body parts like knees, neck, back and shoulders. The places affected by psoriasis arthritis will start paining and will even lead to inflammation. This apart, the color of the skin tone will change to a tinge of blue or purple and can even appear warm when touched. Symptoms of psoriasis arthritis are many and farfetched. They are needed to be recognized and treated properly or otherwise the pain will spread to the whole body. Excessive pain in the joints especially right after waking up or while sleeping. Inability of the joints to move properly that may cause inability to walk, run or carry on the day to day activities. Redness or puffiness of the joints. Tiredness that might affect work at home and office. This will also be accompanied by loss of energy. Throbbing of the joints constantly. Unnecessary swelling in certain body parts. The toes or the fingers getting swelled up. Inflammation of the connective tissues. Aggravated inflammation and pain of the joints. The color of nails of both fingers and leg changing. The appearance of the nails changing and becoming more brittle. Mild to heavy pain in the joints. Excessive back or neck pain. Pain in the entire body. 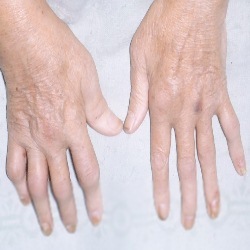 Joints getting inflamed and changing color to bluish or reddish. Pain getting more severe with each passing day. It must be noted here in this regard that psoriasis generally leads to arthritis at a gap of several years and hence during this time it is possible for other parts of the body to be affected by the same since the condition is chronic. Appearance of the fingers as sausages. Pits or ridges in the nail. Nail is the first area of the body that starts decolorizing or losing its sheen and one must immediately understand that something is wrong. These are some of the symptoms associated with psoriasis arthritis, but one must always keep in mind that only knowing the symptom is not enough. One must immediately consult a medical expert and start the treatment. Treatment is only effective when one can recognize the psoriasis arthritis symptom promptly. It is imperative to get the help from a qualified doctor or otherwise the condition will start getting worse. A dermatologist is the best person who can help you fight this condition. He will understand the medical implication of the matter and will then guide you accordingly. Moreover he will take into view the symptoms that are faced by you, your previous medical history and history of family diseases. You are then required to undergo certain tests and once the requisite diagnosis is done, the treatment will immediately start. Knowing psoriasis arthritis symptoms earliest possible is very much essential since this can enunciate early diagnosis and early diagnosis is the key to effective treatment.